When I confine myself to two colors + black, I really like the look! It makes the pictures & words somehow hang together more than when I go crazy with too many colors. I debated about where to put the last bit, the Dark Pools….since it was talking about stuff OUTside the algorithms, I decided to kind of put it OUTside the rest of the drawing, instead of in that little open space in the left below the city buildings…so it sort of works conceptually, but visually it just looks kind of dumb down there all by itself. If I were sending this to a client, I’d cut and paste it up into that space so the whole drawing would look better. Gold/blue color combo is very regal. Limited color palette definitely makes the sketchnote feel like an integrated whole. Since you had space, you could have distinguished the dark pools as outside with a strong line/boundary. That could delineate algorithm v. not algorithm ad helped tied it in. Pretty clean work, which I like. Blue and yellow highlights work well against the black line artwork. Like the brain and head illustration. White space is pretty good, but it seems there are some holes left on the page which suggests a different placement of items might have made the page feel better balanced. Information seems a little lighter than some other entries, though there is a decent balance of illustration to compensate somewhat. Arrows could have been sharper and cleaner. Work on expanding your visual vocabulary, so you have a larger repertoire of objects to include in your sketches with confidence. I like your use of a limited colour palette. Nice clear and simple sketches, too. I found it hard at first to see the title of the talk (being in the middle) as it has the same visual treatment and visual weight as other points in the talk. The big word ‘Stealth’ looks more like the title at a first glance. You used colour very evenly throughout the notes. Try using colour to create visual hierarchy instead of using it as decoration. You could, for example, use the yellow for main points and the blue for secondary points (both in lettering as well as the sketches). This will instantly make your notes much more structured and scannable. I would love to improve managing how much space I have left to work with and figuring out how to decipher what the important "meat" of the talk is versus getting caught up in drawing the illustrations. I guess I'd like to use the illustrations in a visual way to fully communicate the kernel of what's being communicated. 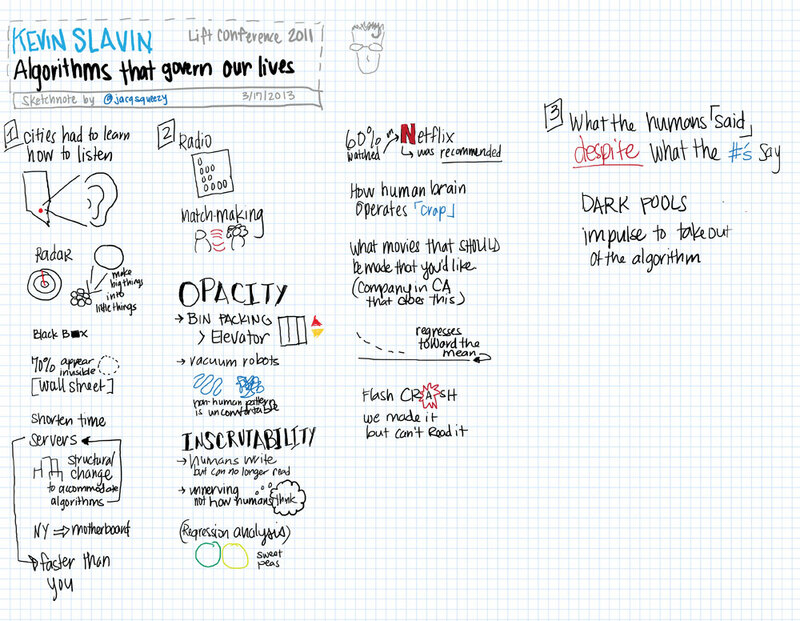 I can definitely see you're processing Slavin's talk spatially and visually. Would like to see more text to help you retain the concept later. Pretty good use of the page. Like that you are using icons and imagery here. Not as detailed with written text to describe the imagery as I would like, which leaves me to guess as some of the information represented as imagery. Some areas seem to have had more time spent, some feel almost rushed. Like the idea of the gray marker for a highlight, but it seems to be a bit dry at points. I like the flow you created in the note by using big arrorws to show the order of the ideas in the talk. I also like your quick schematic style of visualising concepts. I think you might have fallen into the trap that some people experience when they do sketchnotes at first: they try to shift everything to visuals and can sometimes forget that it’s also ok to capture things as text. Don’t loose your wonderful visualisation but try to add some textual explanation or key points sometimes to get even more out of your sketches. Some concepts are so abstract, that language is a great tool to both summarise and to add precision. I usually use clouds as separators and arrows to indicate flow which I rather like, I also like the sparing use of colouras it highlights key points. However I think I should of stuck with one accent colour. It was a rather hard presentation to sketchnote i.e. I don't know much about algorithms so I think I used too much space explaining what it was (which was offered at the beginning of the video) rather than sketching the different ways they are used which could be more valuable. However I think the way I've done it is rather appropriate given my knowledge of the subject as it will be useful reference in the future. Great use of shading to create depth and distillation of language is strong. Lighter colors of markers for the clouds and shading would help them recede so your overall page would look so dense and a little crowded. Love the bold title area, the bloody axe and the generally bold feel of this sketchote. Color highlights are nice too. Some lower case lettering would make the lettering friendlier feeling, a little more whitespace between objects would help the overall sketchnote. I really like the clouds as a layout approach too! Plus the whole page exudes enthusiasm and positivity! I'd go easy on the grey shading of whitespace. Also one colour highlight is probably enough. Your sketchnote is clearly structured into groups of thoughts. 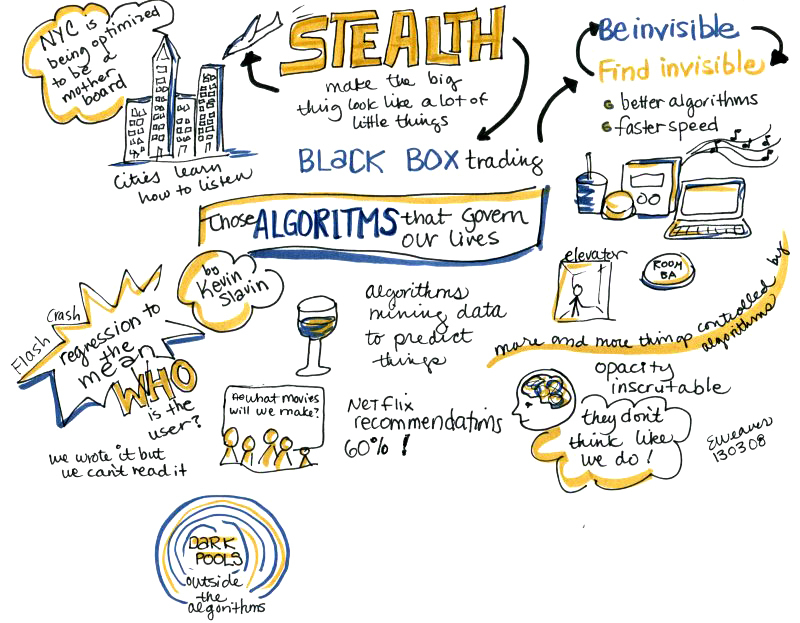 They way you summarised the different concepts of stealth and black box trading is both very nice visual and very clear and easy to follow. The cloud separators work very well to separate the different talks while the arrows between them show the flow of the talk. Nice touch to have yourself in teh bottom corner ‘thinking’ of all these things. I feel like you followed the talk very nicely for the first half while you didn’t capture much towards the end. Did you maybe feel you ran out of space? In that case, don’t hesitate to start a second sheet. You sketchnotes don’t have to fit on a single page. You never quite know how a talk is going to go and how much interesting material a speaker has to share. You can always piece the separate pages together in Photoshop after scanning. I like the idea of the cross section of the plane to help explain stealth/breaking stealth. I like that by the end of the talk I could see how linear it was, though I didn't quite grasp that during the process. If this filled the spread in the notebook, this would have just enough room to breathe. Perhaps consider starting in the middle of the page and see what happens? Really good blend of imagery, text and highlighting ideas with light color washes. I can see how much you like to connect elements to each other. Would love to see a horizontal canvas to let you connect even better and not have the right page feel like a bit stuck on the side. 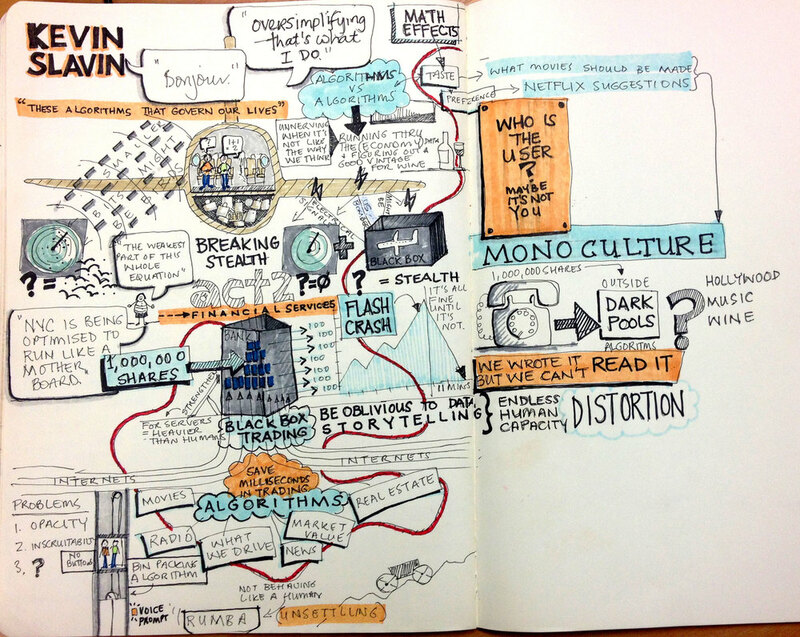 Really love the visual illustration style, colors and layered feel of this sketchnote. Empty lower right area suggests a little less layering and more use of white space could help spread the information across the whole page. I love the feel of the overlapping elements, but it can also make the information harder to process. Kinda busy—a bit more breathing space may give key concepts more space to shine. I like the colour scheme and the line quality of your sketching and your handwriting. The whole piece looks really dynamic and inviting to dive in. The sketch of the bank building connected to the internet in the center of the page is really great, it captures the point very well. Overall your sketch is super dense with a lot of varied elements. On the one hand, this makes it very intriguing to look but on the other hand also makes it quite hard see the structure or the main points of the talk. Try leaving more space between different points and thoughts, probably more than you feel is right or necessary. It will make it much easier to see where one idea ends and the next one starts. It also gives you the possibility to fill in missing or related points throughout the talk and add structural elements to help make the hierarchy of ideas in the talk clearer. The text and visuals are large enough to show emphasis and hierarchy between the topics. The characters in the visuals look welcoming and won't intimidate the reader. Managed to catch the main points and figured out a layout present the info. The sequence flow could be improved. Some of the visuals under "Black box trading" could have been better visualised and spaced out, rather tight right now. Wasn't quick enough to catch some of the points Kevin mentioned so areas like "Inscrutability" and "Dark Pools" may not be complete. Overall I did my best and glad I learnt more about my capabilities. Scan these — I want to zoom in more! Perhaps explore color, but don't feel like you must. Yes, very solid capture of the content with friendly characters bringing ideas to life. Would love to see a second color added to see how you could highlight and improve flow. Really love your more detailed title area and illustrated imagery. Love that you weren't feeling tied to a single page and used a second page, rather than trying to fit everything into a single page. Good balance overall. Francis Galton's head is pretty close to the vertical dashed line, maybe the pool in the lower right corner of page 2 could use that space a bit better. Overall, not much to correct here. Love the organisation, the cartoon illustrations, the type. Awesome. Consider adding some grey shading to bring depth to some of your imagery. I think your notes are great. Great structure and great chunking of key points, especially pulling out the big key words in the second half (OPACITY, INSCRUTABILITY, ...) in big type and then adding examples and details as smaller elements. You also created lots of clever visual metaphors, like the conveyor belt with the different examples coming out of the algorhythm machine and the NY microchip (really cool). It’s hard to give tips for improving but I would be really interested to see you start experimenting with an additional accent colour. I am sure this would take your notes to an even higher level. You could also try to do a little ‘warm up’ before sketching a talk. Your sketches get stronger and stronger throughout the talk. Doing some random little sketches before you start will give you a little head start and so you don’t have to warm up during the talk. Love how clean, consistent and graphic the page comes across. Your illustrations are super. Stellar record of points paired with evocative icons. If you think of this sketchnote as a first layer, could you add more structure as a second layer made with a second color? Create connections, framing, pull out themes. Great amount of info capture, like the clear, small icons. However, the large amount of info in small disconnected sections with arrows for flow makes for a very complex sketchnote visually. With so much to process, my mind reacts by wanting to just scanning the icons and stopping there. Love so many little icons scattered around the page. Had the fun of a Where's Wally book! May want to consider which elements are important (elevate, with stronger lines, larger type, shading etc) and which are less important (let them fade to the back). At the moment everything's at the same level. I love your little sketches. They are neat and witty and have a distinct style. Your own variation of doing star people gives them their own character and works very well within your style. And you are quick! You managed to capture and sketch lots of material. What is obvious at the first glance of your sketch is that everything you capture has the same size, the same visual weight and the same spacing. 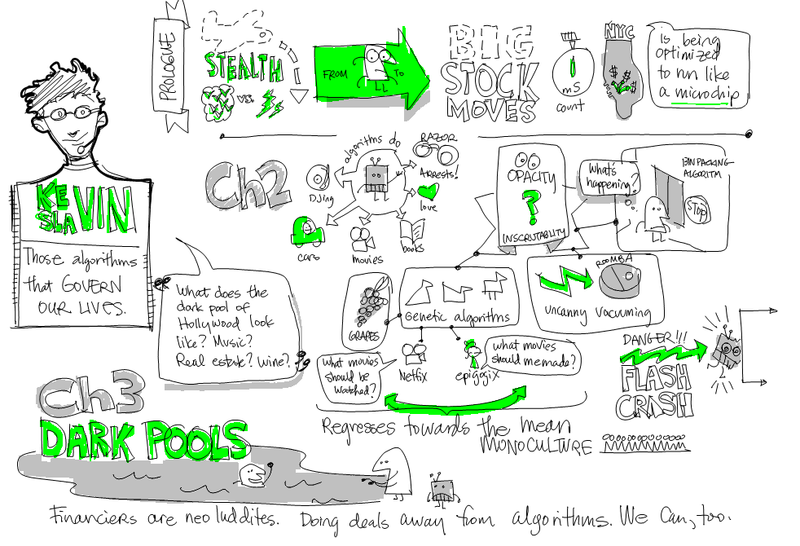 It make your sketchnote look very nice and even, but at the same time it doesn’t help to make it easy to read or scan. It almost feels like you are steno graphing the talk idea for idea. Try to get some variation into your sketches and your writing. Try to decide which things are more important than others while you listen and express this hierarchy through variation in size, line weight, colour and spacing. Try different sizes of writing for key points compared to details. Make sketches of key concepts bigger. Try to use separators and frames to group clusters of points that belong to the same thought. Love the KeVIN SlaVIN detail. Good use of imagery and scale. Really like the title used as a hub with the examples as spokes around it. Clever structure for the speaker's name, interesting flow structure. Yellow flow inficator works, but seems to cover some under elements more than I would like, maybe coloring around solid black arrows would help with this. Like the idea of a meandering snake following the presentation journey. Risky if there is no big pay-off at the end though! I'm not big on lots of colour. Also, consider expanding your visual vocabulary so you have more imagery that you can just whip out without thinking to represent various concepts. The structure in your sketchnotes is really strong. I think you don’t need the fat arrows in between the items to make the flow work. The yellow stream does this nicely already. It feels like you found it easier to summarise the first half of the talk. You have captured the key points nicely. In the second half it feels like it was harder for you to distill all the examples and smaller bits into clear bigger chunks. To practice summarising and structuring key points of a talk, you can try and do a first run through a talk only using words, but paying a lot of attention to the different levels of hierarchy within the ideas and express these with different sizes, frames and colours. In a second run, try to pick out the main concepts and add sketches for these. Over time, you’ll be able to do both more easily at the same time. Your loose drawing stlye has a wonderful energy to it. If you were sharing these or sketchnoting for a wider audience, I'd like you to make these a little neater and tghter without losing the character. Love the overall feel and flow, great illustrations! Two-tone highlight works well. Not much to improve on here - maybe more stylized lettering in the title block under Kevin's name. Love the dark pools! Love the caricature of the speaker! Not really much to improve, but you could try expereimenting with your use of colour, to use it more effienciently to guide the eye to the main points. Right now the green appears in objects that lend themselves to be filled for visual reasons (to create some even spots of colour throughout). Try using it on the parts that actuallu hold the key bits of information. If this ends up looking too boring or unbalanced to you, you could use a second lighter shade of the smae colour to add some more ‘decorative’ balancing shading. You might also look at slowing down just a tiny bit when you do your block lettering. With a little bit more attention when doing it, you’ll get it way neater with not much more effort or loss in speed. I like the colours they help balance image. I drew extra birds, maths signs and money bags in when finished... i would do less in future as i think more white space would be easier on eye. ... And yes to more white space and/or doing all of one symbol in one color (i.e. all the moeny bags green, all the math symbols blue and all the birds purple) to support the structure and the different areas even more. Love that you are using purple, rather than black for a base color with highlights. Really different! Also quite like your simple and clear icons and use of space. Light blue and green lettering right in the center seems hard to read. Maybe purple there with highlight colors used in another way would help. Could use maybe a little more descriptive text to balance imagery. So colourful! Normally I'm not one for too much colour, but I think this totally works. I'd try for some more distinctions between important and less important concepts. Flash Crash stands out, but the rest sits at the same level. The symbols and birds in the whitespace don't help this. I love how neat your sketches and your handwriting are. They also have a very nice dynamic to them. The sketch of the DJ is great and full of character, the sketch of the vehicle generating algorhythm is really nice simpified and captured. I would try to limit your colour palette to just one base colour and one accent colour. While you notes looks really nice and friendly now, the use of colour is mainly decorative. You could get much more clarity and structure into your notes by just adding splashes of colour to attract the eye to key points. You should also not be ‘afraid’ of white space. The little birds and symbols you added throughout the note don’t add information and even make the structure harder to see because everything gets very evenly distributed. Good sketchnotes need a lot of visual hierarchy and a lot of contrast, which can sometimes go against our initial feeling of wanting to create a ‘harmonious’ picture. I sketchnoted on a mobile app called Papyrus, so I liked that I was able to move around columns, to make each "chapter" closer together or further apart, and the ability to switch between colors. It also offers "infinite" canvas/page size, so I'm able to keep topics or Slavin's "chapters" all in one (or two) columns - I did not experience any, "oops, I ran out of space at the bottom of the page." Live recording - I was not comfortable with not being able to pause the video, so I'd like to practice more live recordings so I don't miss as much information. I tend to be more spatial, and anti-linear - so I'm curious how you'd reorganize this talk in Papyrus not in vertical columns. How would you understand the content in a new way with a new shape? Really like the clear structure on the left side. Nice that the title is clearly marked for visibility. Right page is starting to look sparse and not as structured or as visual as the left side of the page. Experiment with different layouts; practice lettering with a couple of typefaces to gain confidence. Watch the clock and compare to available space on page. I like the column structure. Good use of white space to make individual points stand out. I like the title treatment as well. Looks almost like the labelling on an architect's blueprint. It seems like you started struggling with capturing things in the second half of the talk. Try pushing through, even when energy gets low. The numbering of the columns helps; you could even try to give each block a summarising title in big letters.